LUCIE'S EDGE- A Unique Enclave of Seclusion! A well maintained 3.54 acre estate home site which is full of Old Florida mature oaks and rests at the edge of the St. Lucie River. It is a rare offering of Old Florida at it's finest in the desirable location of White City. Showcasing this enclave is a 2001 Southern-style Plantation custom built home featuring 4 beds 3.5 baths,and a separate Guest house, complete with an indoor steam spa, outdoor shower, and sparkling pool.The 2-story custom main home, built in 2001, is a ''Plantation style home with a palm beach flair!'' It has a large family room and open kitchen concept featuring a kitchen island, beamed ceilings, with it's finest features of distressed maple wood floors in the main portion of the home and elite stainless kitchen appliancesThermador and Bosch. The exceptionally large master bedroom is located downstairs and features a master bath with a custom built, grand, walk-in closet and claw tub. There is a guest bedroom and bath upstairs and two additional guest bedrooms that consist of a Jack-n-Jill shared bath. 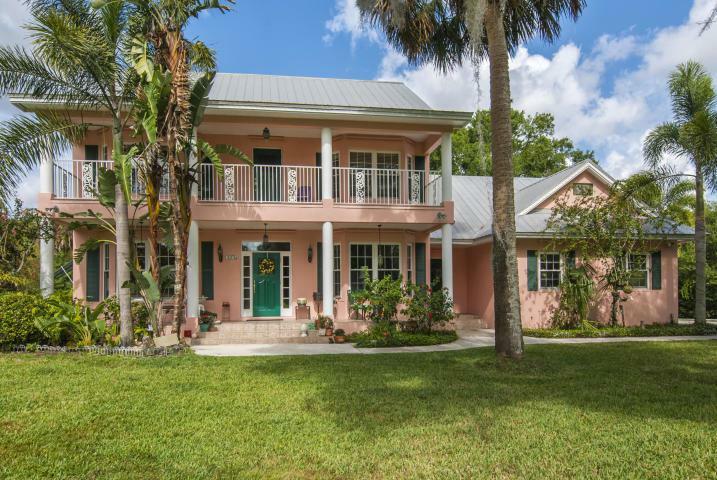 This home also features 2 large covered porches with wrought iron detail and magnificent views of the Old Florida Landscape in a very secluded setting amongst majestic oaks and indigenous flora and fauna. The property also includes Maple, Bamboo, Fox Tail and Queen Palms which is an added plus to the bonus fish pond and fountain- a great natural ambience!A separate guest pool house is complete with a kitchen and open concept living and entertainment area with an indoor steam spa/shower. It overlooks a huge sparkling pool which is lined with Chicago brick decking and has a serene outdoor shower amongst the Oaks. This cabana style pool home is ideal for home office, artist studio or guest house.